Choose, How Do You Know What Is Right For You? 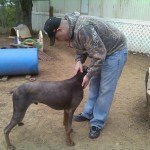 Yesterday I had the privilege of accompanying my son to the Northern California Doberman Rescue shelter. I had never been to a rescue shelter, only the local pound. We had talked at length about why he wanted a dog. It made sense since he is single and lives hours away from the closest family and friends. Having a companion to come home to after a long day at work is comforting. Dan, my son would have a walking partner, someone to give attention and affection. All the right reasons to get a dog, man's best friend. At first thought, I was not too keen on this type of dog. Any mother could attest to the fact that these dogs have a reputation, and not a good one at that. Growing up, my aunt had several of these dogs. As a small girl I remember them being big and somewhat mean. I know that my cousins were not afraid of their dogs, but I was. The dogs never hurt us, but they did intimidate us. Knowing those dogs were there, we always were on our best behavior not wanting them to attack us. As we drove further out into the countryside, my son and I talked. Dan explained that he wanted a dog that would be a good friend and protect him. He did not want one that was vicious and cause trouble either. He wanted to choose, but how would he know what was right for him. He wanted a dog like the one he had as a kid. Cheeto was a black lab, Queensland Healer cross. He leaned more towards the goofy lab side of his genealogy and was a great kid's dog. Dan had tons of memories of his dog who was the brother to Gabby, our dog that died last year. The further we drove the more questions I asked. He still had not convinced me that his choice in breeds was the right one for him. Although he is a grown man now, my motherly instincts were kicking into high gear. His safety and that of his neighbor's children was my biggest concern. When you own a dog, it is a liability. The responsibility is a serious matter. Working full time the dog would be home by itself most of the day. Would it be house-broken, trained and a good fit? When Dan brought Dexter home he worked at the local bank. He did not have time to work with and train this little puppy. Remembering the amount of work, it took to train him over those years, would my son have what it took to be patient and put in the work. We finally arrived at the rescue shelter. Barking dogs greeted us as Dana, the owner came to the door. As she welcomed us in, the dogs' varying barks rang in my ears. Twenty-six dogs called this shelter home. All but one were Dobermans and the odd man out was a cute Basset Hound with bad knees. Dana showed us around and then invited us to sit to chat a bit. As I looked around, I could see each dog inside it's own crate. The facility was very clean; you could tell she took good care of the dogs. All had a bucket of fresh, clean water and clean bedding. Feeding times were morning and evening and the dogs rotated for turns out in the exercise yards. 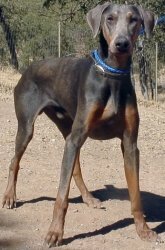 There were black, red and blue Dobermans each unique in appearance, demeanor and stature. Some of the males were huge, intimidating dogs. The females were slightly smaller and had features that are more feminine. Some of the females were right there with the males in the intimidation category. Dana knew her stuff when it comes to Dobermans. She has bred, raised and showed Doberman pinschers for over two decades. Her personal Doberman is a red and drop dead gorgeous, friendly as they come. She is a champion and comes from a long line of champions. The hard work it takes to care for the dogs that have been rescued shows in Dana's attitude and love of each dog. A file kept for each dog that includes all medical history, any abusive history, why they needed rescuing and their personality traits. To say I got an education and training in rescue, Doberman pinschers and what it takes to provide care for twenty-six dogs is an understatement. I give her all the credit in the world and encourage any donations one might want to give to support her cause. An hour or two had passed as we visited and got to know Dana, her history and that of the dog's history, too. Cyrus is native to California. His last owner and her other dog were not a match for him. Within 48 hours, he had found his way to the Northern California Doberman Rescue and Dana. When the crate door opened, Cyrus bounded out like a race horse out of the gate. Young and full of energy he headed straight for Daniel. We could tell it was time for some exercise and energy relief so outside we went. Cyrus must have run for over fifteen minutes before he settled down. Once again, he headed straight for Dan, ignoring Dana and me. Our overall stay at the rescue was about four hours. Dana's love for Cyrus was evident. She was not releasing this dog to another unlovable home. Making sure my son had the proper equipment in place at home; a big yard for exercise, a crate and bedding were all necessary before he could take the dog. 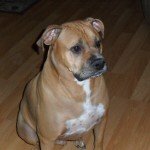 A qualified veterinarian would need to see Cyrus to continue his heart-worm medication. An appointment with a dog trainer would ensure both my son and Cyrus would get the most out of their relationship. In the end, Cyrus and my son was the perfect match for each other. To watch the interaction between the two of them made my heart happy. Now I can rest assured that Daniel will have man's best friend and a protector all rolled into one. This experience reminded me of getting started in business. Often times we can jump out of the pot only to jump into frying pan. We may dislike our job so much that any business opportunity can look like just the right business for us. The grass is greener on the other side, when the opposite can be true a lot of the time. Therefore, when we are considering a new business venture, such as auto transport, we want to make sure it is the right fit for our personality, our passion, and us. Some are good at physical work, others are excellent at office work while yet others are excellent with people. If we are going to pour our heart and soul into building an auto transport business we need to be sure it is what we love. Just like Cyrus and Daniel, choose we must and then we will know what is right for us.